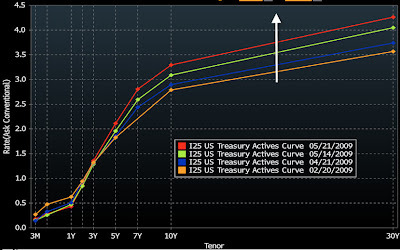 Sober Look: The Treasuries train. Hop on board. The Treasuries train. Hop on board. "May 21 (Bloomberg) -- Treasuries dropped after the Federal Reserve’s purchase of U.S. debt due in 2013 to 2016 as traders shifted focus to next week’s three note sales. " Unlike other buyers who use existing cash to buy Treasuries (taking cash out of the system in the process), the Fed simply creates money. We all know what that means. Might as well give the US Treasury the “printing press” so that rather than borrowing from the Fed, it can “print” money when it needs it.